NEW LEASE OF LIFE: "The fresh ideas and innovation brought by start-up companies can break Japan out of its sense of stagnation, and overcome the pessimistic future projections for Japan caused by its falling birthrate and ageing population." - FUKUOKA MAYOR SOICHIRO TAKASHIMA, on the promising future of the city as a model for the rest of Japan. As Japan faces the grim prospect of a population that is shrinking as fast as it is growing old, a nationwide movement has begun to revitalise rural areas and woo people from the megapolises of Tokyo and Osaka. This is above and beyond the central government's vision for a Society 5.0 - with elements similar to Singapore's Smart Nation drive - that centres on using artificial intelligence and the Internet of Things to better the lives of Japan's residents and ignite its economy. Several cities and towns have embarked on local initiatives to ease regulations and come up with urban solutions to attract new businesses, and, in turn, more working-age residents. There is no standard definition for a smart city, which French newspaper Le Monde defines as one that strives to improve services and the quality of life, reduce costs and protect the environment through civic engagement and technology. Fukuoka, in western Japan has, for one, built up a strong reputation as a smart city in its journey to becoming the nation's eminent start-up hub. 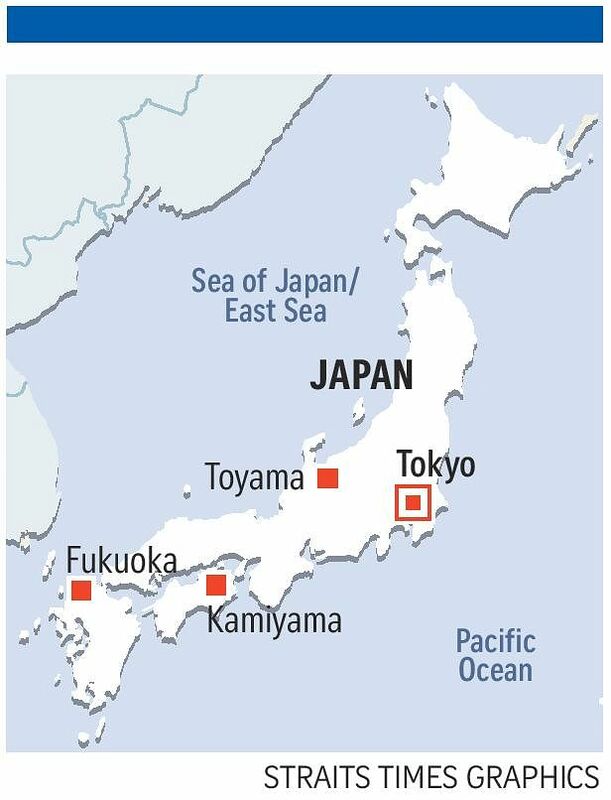 The coastal city of 1.5 million people is the fastest-growing major city outside Tokyo, adding 75,000 people in the five years to 2015. In the same period, the number of residents aged between 15 and 29 surged 19.1 per cent. Its mayor, Mr Soichiro Taka- shima, who was the youngest to win the post in the city's history when he was elected at 36 in 2010, brings with him a global outlook to his governance. He was inspired by the vibrant entrepreneurial scene of Seattle, which he visited one year into his term, that led to such global names as Amazon and Starbucks. He told The Straits Times: "To this end, I felt that the urban environment, including rich nature and culture, high transport convenience and the presence of excellent and open universities, can greatly influence the birth of creative ideas." Major transport arteries such as the city's airport, sea port and central train station are all within a 2.5km radius. And the city also benefits from its location - the two hours it takes to fly from Fukuoka to Tokyo can also get one to Shanghai, Seoul and Taipei, and the city is thus being branded as a gateway to Asia. To ease the language barrier, public signs in the city have long been in English, Japanese, Chinese and Korean, which Tokyo is only starting to put in place. His efforts led the city, with lower business costs and cheaper rents than Tokyo, to be designated a National Strategic Zone for Start-Ups in 2014, under which entre- preneurs can benefit from lower taxes and government subsidies. Foreigners also get more relaxed visa regulations for their start-ups, and have six months to rent an office space, as well as hire at least two full-time employees or have a capital of five million yen (S$62,000) to qualify for a permanent business visa. To ease the process, the city of Fukuoka has launched a Startup Cafe that has lawyers, consultants and interpreters on standby to impart advice on everything from tax to human-resource issues in as many as 11 languages. As at last month, the cafe has led to more than 100 new companies, with 14 of them opened by foreigners. Most of them are technology and nursing-care firms. "The fresh ideas and innovation brought by start-up companies can break Japan out of its sense of stagnation, and overcome the pessimistic future projections for Japan caused by its falling birthrate and ageing population," said Mr Takashima. "What is most important is to create a society where people who are willing to take risks are respected." The mountainous town of Kamiyama in the central Japan prefecture of Tokushima has also seen an influx of technopreneurs, who are relocating from Tokyo to set up remote satellite offices outside the capital city. One huge asset for the laid-back town of about 6,200 residents - down from a peak of 21,000 in 1955 and with senior citizens aged 65 and above comprising 46 per cent of the population: a fibre-optic high-speed broadband network that can rival the speeds in Tokyo. Chief to this effort is Mr Shinya Ominami, who leads non-profit organisation Green Valley and who has been championing "creative depopulation". The alumnus of the Stanford School of Engineering in the United States has said he wanted to create a model such that young talent will continue to be drawn to the town even as the population ages and shrinks. The town, which reportedly has a French restaurant and a pizzeria, is also drawing creative types with its artist-in-residence programme for budding artists. Fukuoka and Kamiyama join Toyama City, which has won global accolades as a pioneer in Japan in implementing smart-city solutions. The city of 420,000 people, located about 400km north-west of Tokyo, rolled out its plan in 2007, integrating a local tram network, a light rail transit system and bicycle-sharing methods to create a dense city centre and reduce carbon footprint. The World Bank has praised Toyama for its "expertise in infrastructure development and service delivery for elderly citizens, revitalisation of the city centre, densification, and natural-disaster risk management", noting that it is a hub for such industries as robotics, banking and pharmaceuticals and a major producer of hydroelectric power.